Although both design and art use similar techniques and require artistic inspiration, design is applied creativity with the purpose of enhancing the function of a product in the specific context of needs, values and trends. Art usually precedes the development of practical concepts and conventional techniques including the use of new materials. Design puts them to practical and industrial use. Similar to art, however, design is linked to a time and a specific era. Design is omnipresent, even in the most mundane items of daily use. Virtually every product and every service is designed to serve a need and evoke a desire. Design explores the purpose of a product and creates its value in terms of functionality, aesthetics and desirability. While design is not a new phenomenon, the way it has become idolised and prized on a mass level in an industrial and post-industrial world is new. Products and services – whether physical or digital – have become easy to multiply under norms of standardisation, serialisation and globalisation. Single products are now marketable to hundred millions of people, and the greater the proliferation the higher the value attached to design and its propriety. The race to protect intellectual property through patents and copyrights shows how design and a product’s emotion have become more important than the basic function. Or one could say that functions as status and style have become as important or even more important than a product’s original function. Thus design is applied not only to serve needs, but to create them. Design has become intelligence invested into a product or a service that is a property in its own right, and which may provide more value than the original function of a product. CADEAUX JEWELRY is established in Germany in the second half of the 20th century when art styles as modernism, cubism and realism have long emerged and begun to influence trends in architecture and product design. 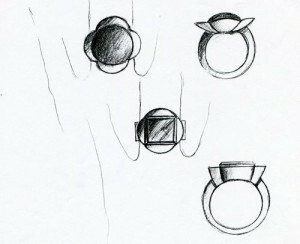 While it is common for products to embody shapes and idea that originate in art and culture, jewelry is rather late to adapt rationality, functionality and objectivity, perhaps because jewelry is important also as storage of value and for status by wearing rare objects of precious metals and gems. CADEAUX JEWELRY creates a niche reflecting modernist concepts as clear shapes of unmistakable significance and tends to highlight the precision and skills of the techniques applied in the process of making the product, and one of jewelry’s functions explored is communication of identity, personality, and authenticity, or a Jewelry Identity. CADEAUX JEWELRY’S design is based on original thought and planning, determining a product’s development, production, marketing and use. It includes not only form, but also needs and desires such as beauty, style, status, as well as quality, durability, usability and material value.